Click the thumbnail for a bigger size. For print quality photos, click here. Osoita kuvaketta avataksesi suuremman kuvan. Painokelpoiset kuvat löydät täältä. 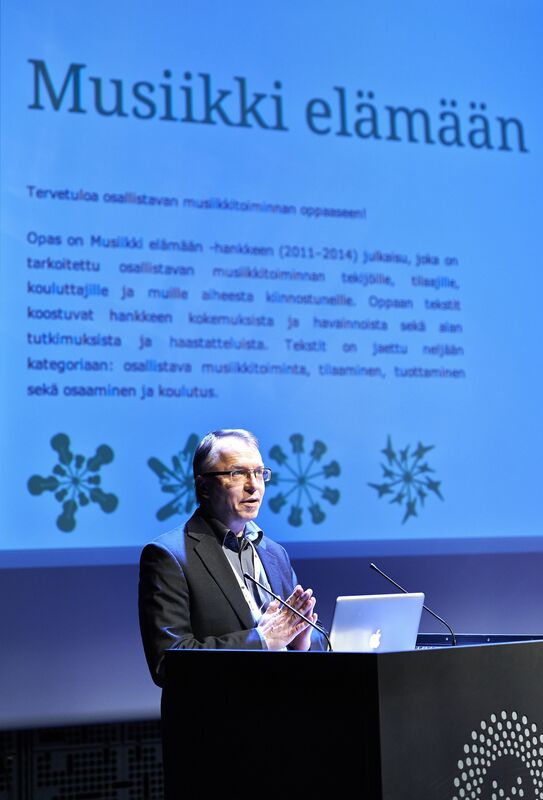 Presenting in an international conference the web guide on regional participatory music and audience co-operation, a publication produced by the EU-funded project Music for Life ("Musiikki elämään" in Finnish) which I was lucky to be the director of in 2011-2014. 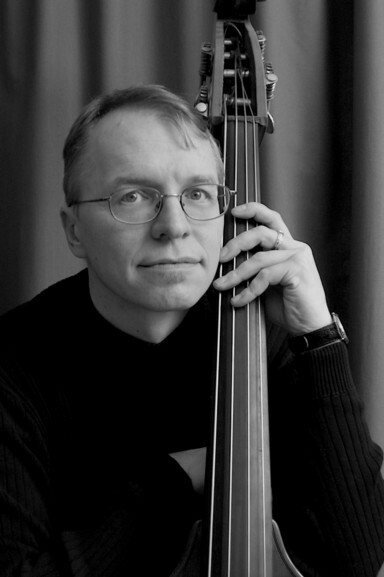 Conducting the 50-piece Metropolia Orchestra in May, 2012. 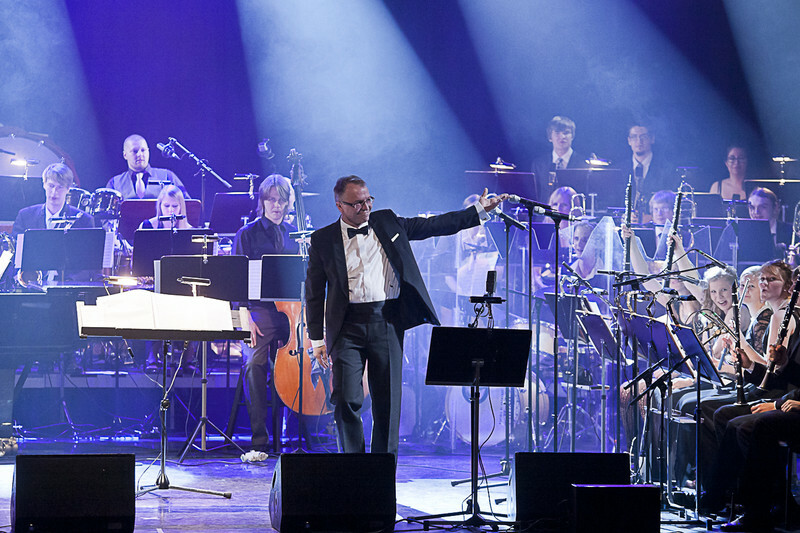 We sold the Savoy theatre of Helsinki out with a concert entitled The Great American Songbook. 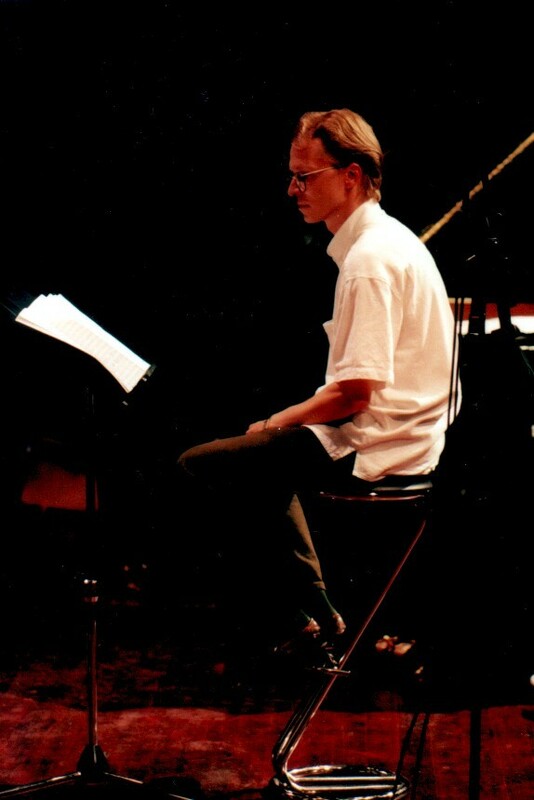 Later on, we recorded most of the repertoire in studio, to be released as a CD in the autumn of 2012. 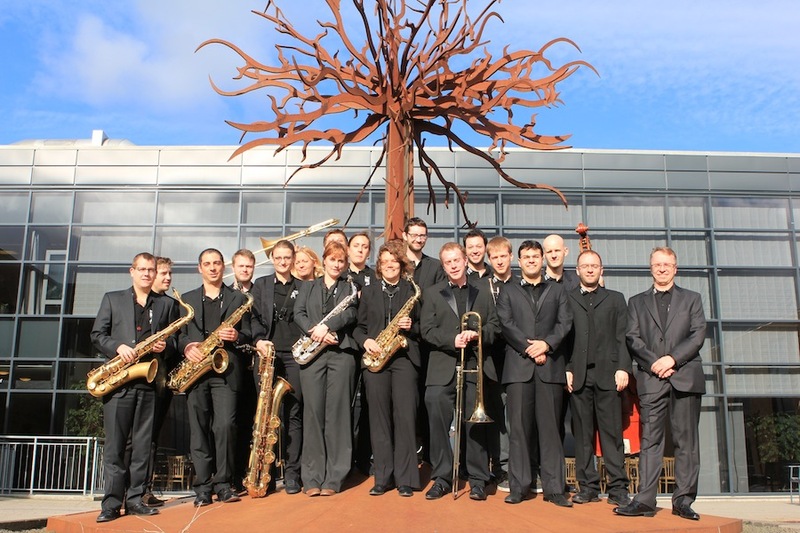 The European Jazz Orchestra of 2011 poses in Vildbjerg, Denmark during the rehearsals for the orchestra's European tour in April, 2011. I had the honor of conducting this great multinational orchestra of outstanding musicians and writing new music for it. After giving a lecture on jazz composition at Berklee College of Music, Boston, USA. 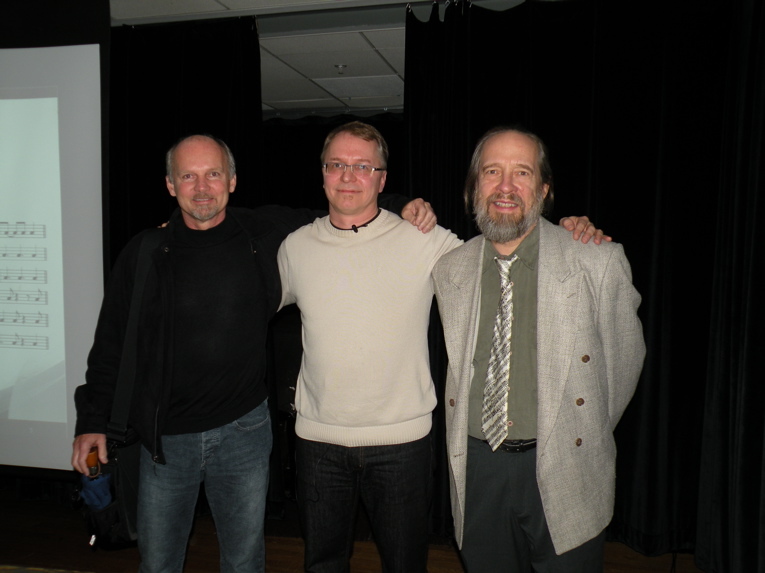 Here with Kari Juusela (left), Dean of the Writing Division, and Ken Pullig, Chair of Jazz Composition Dept. Later that week I conducted some of my music with the Berklee Jazz Composers' Big Band. 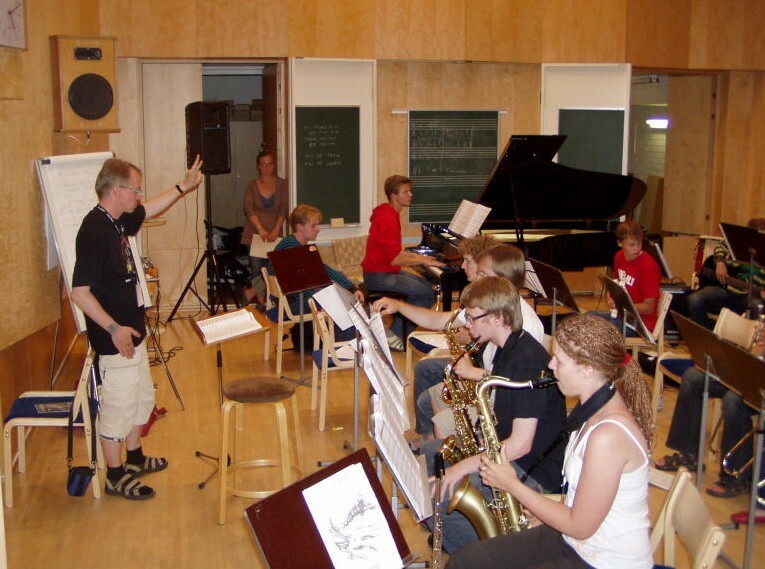 Rehearsing Big Band II at the Imatra Big Band Summer Course, which is held annually in July in connection with the Imatra Big Band Festival. Boy, that summer was hot! 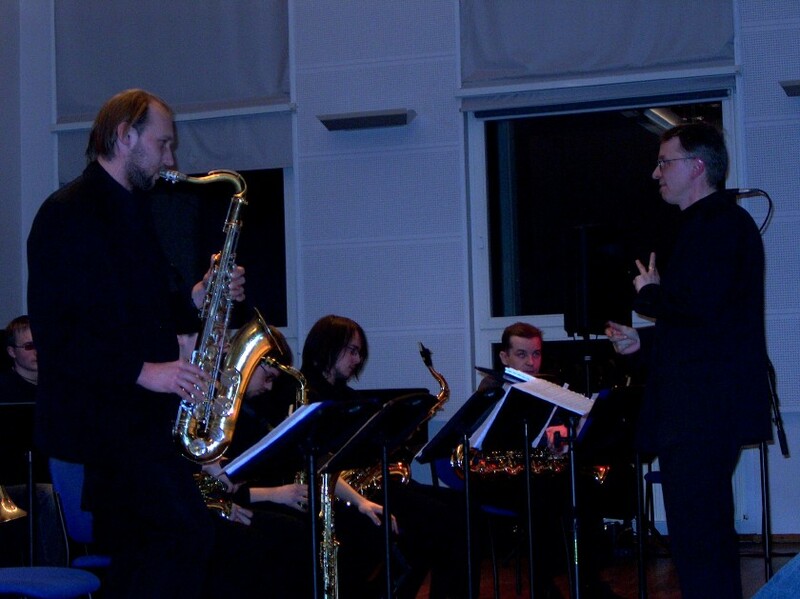 In concert, conducting the Estonian Academy of Music and Theatre Big Band, Tallinn, March, 2006. 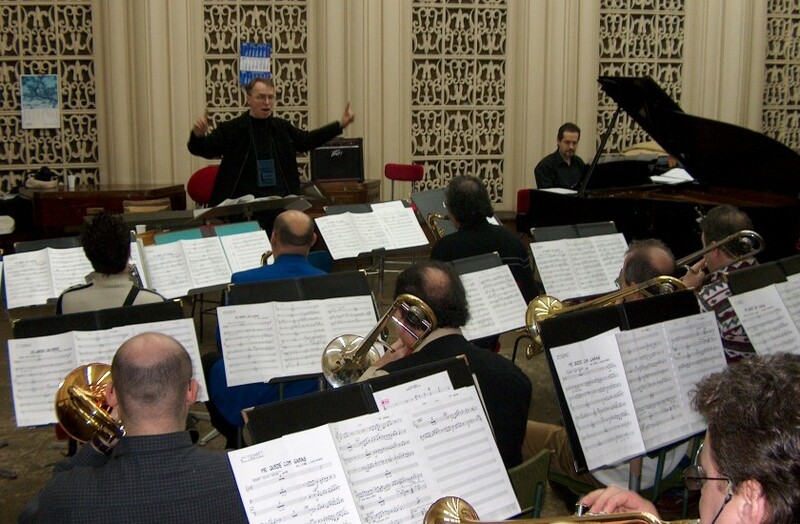 Rehearsing the Radio Romania Big Band in Bucharest, Feb. 2006. We had a wonderful concert at the Radio Romania Music hall that week, featuring Pauliina May on vocals. 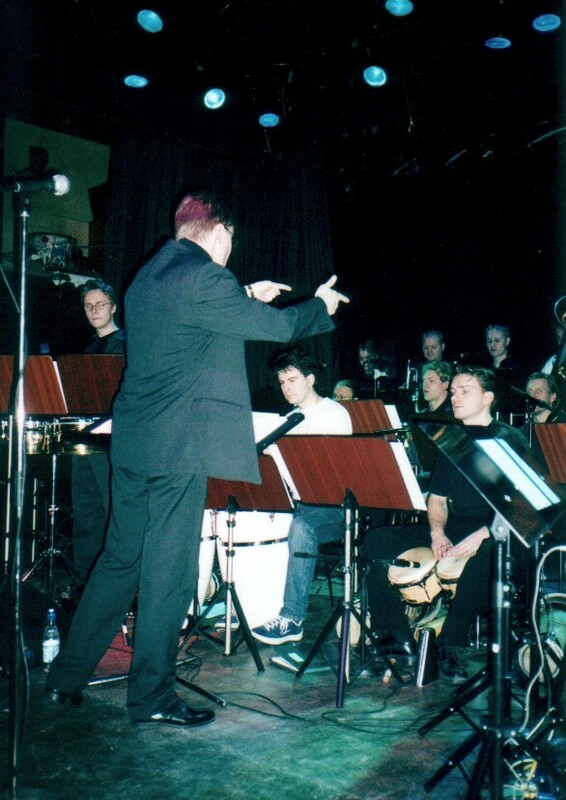 Conducting the UMO Jazz Orchestra in May, 2005, in a concert featuring some of my new compositions. 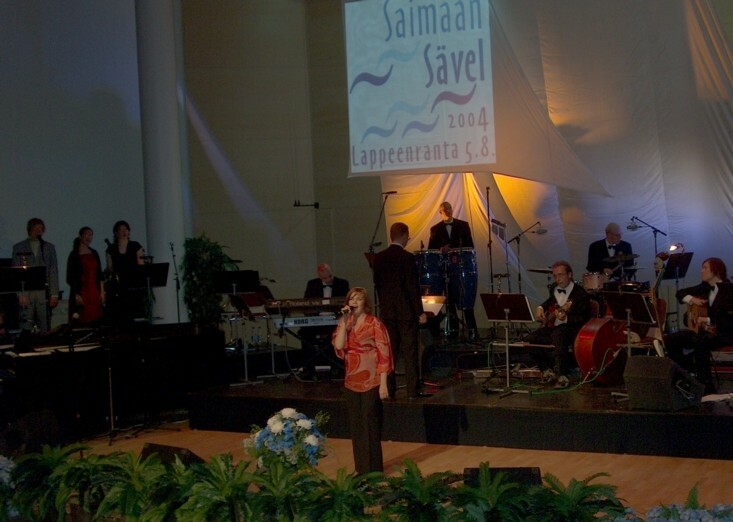 Conducting the final concert of the national songwriting contest Saimaan Sävel in Lappeenranta, Finland, Aug. 2004. 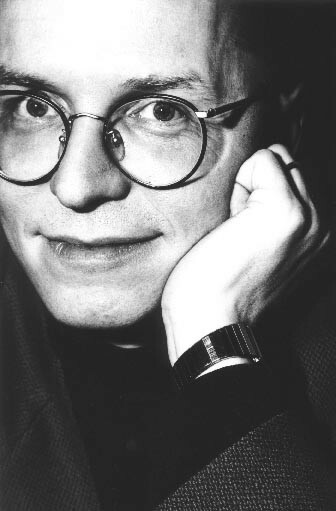 The vocalist is the ever-soulful Riitta Keränen. 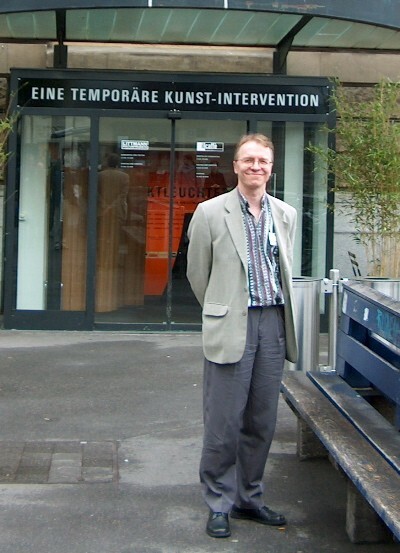 I was teaching at the 2004 IASJ Conference held in Freiburg, Germany. This was one of the students' gig venues. 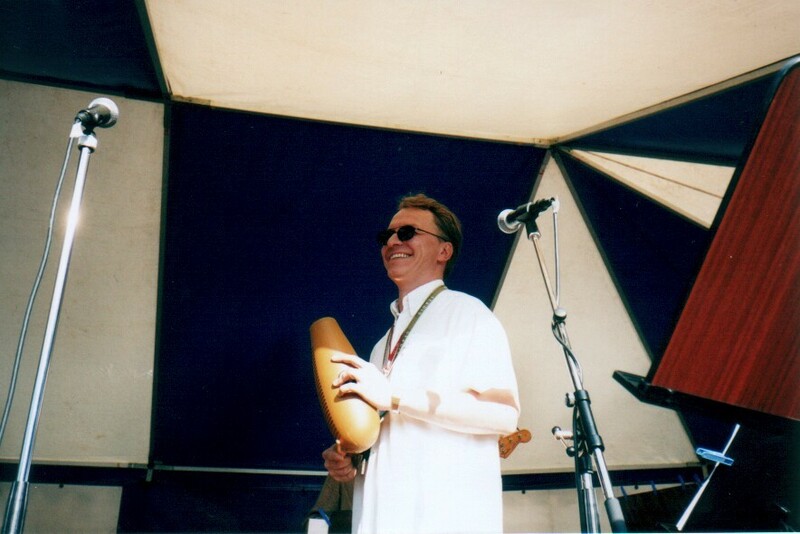 Onstage at the Pori Jazz festival, Finland, July 2003. 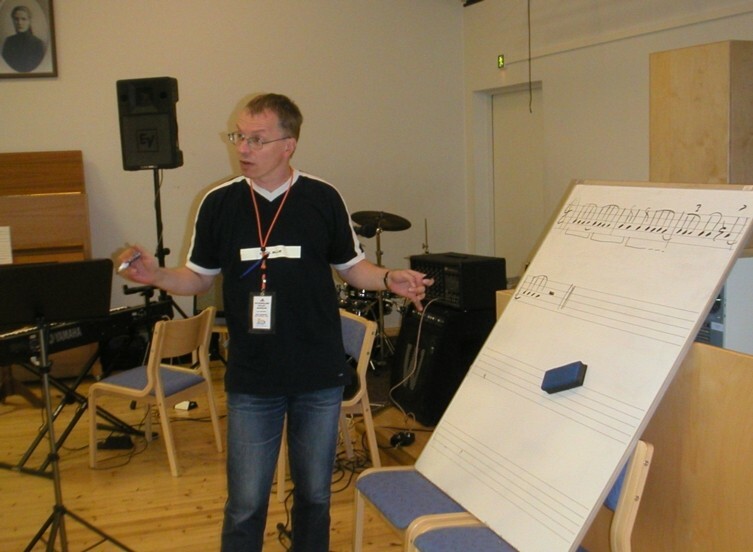 Teaching at the National Pop & Jazz Summer Camp, Nakkila, Finland, July 2003. 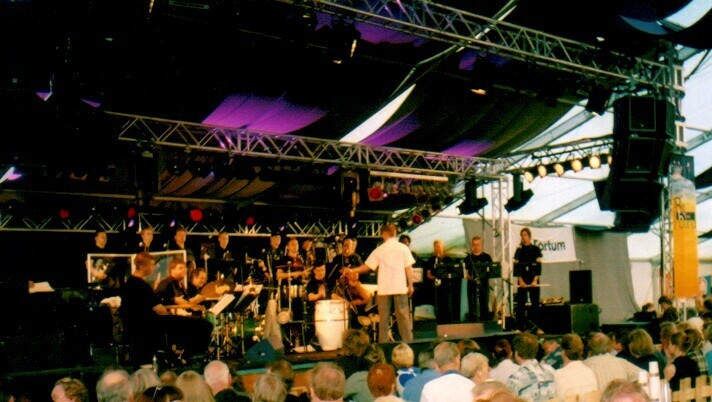 Jere Laukkanen Afro-Cuban Jazz Orchestra giving a concert at the Imatra Big Band Festival, July 2003. That's me wearing a white shirt. 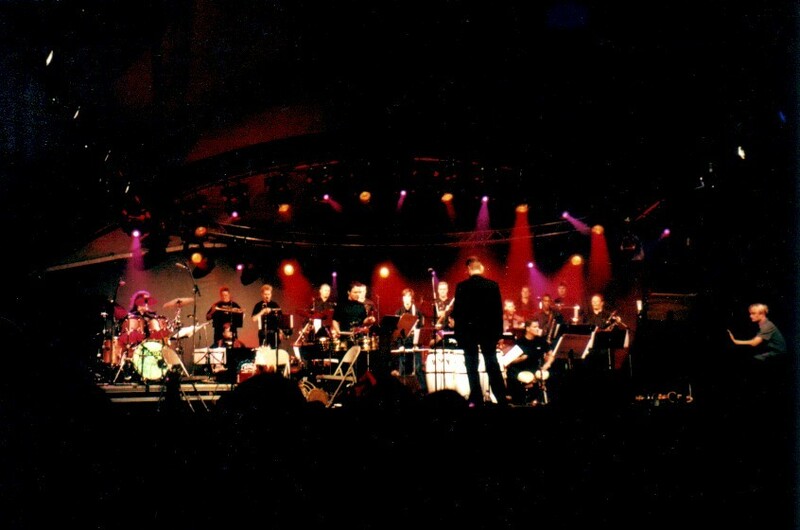 Onstage with my own orchestra at the Huvila venue of the Helsinki Festival, Sep. 2002. Nice lights, huh? 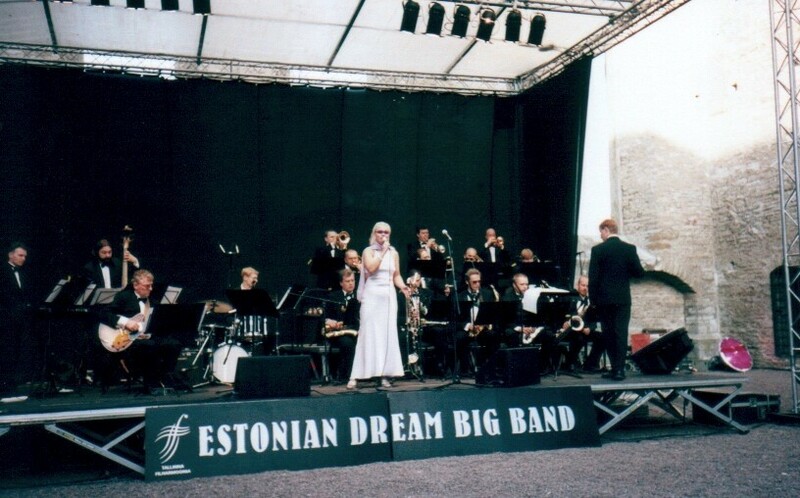 Me (far right) conducting the EDBB in Tallinn, Estonia. The concert venue was built inside the beautiful ruins of the ancient Pirita convent. The vocalist is Pauliina May, with whom I've worked successfully during many years. Posing for the press with Yoel Terry (left), Sami Pöyhönen and Lenni-Kalle Taipale while celebrating our first CD release Jere Laukkanen's Finnish Afro-Cuban Jazz Orchestra. 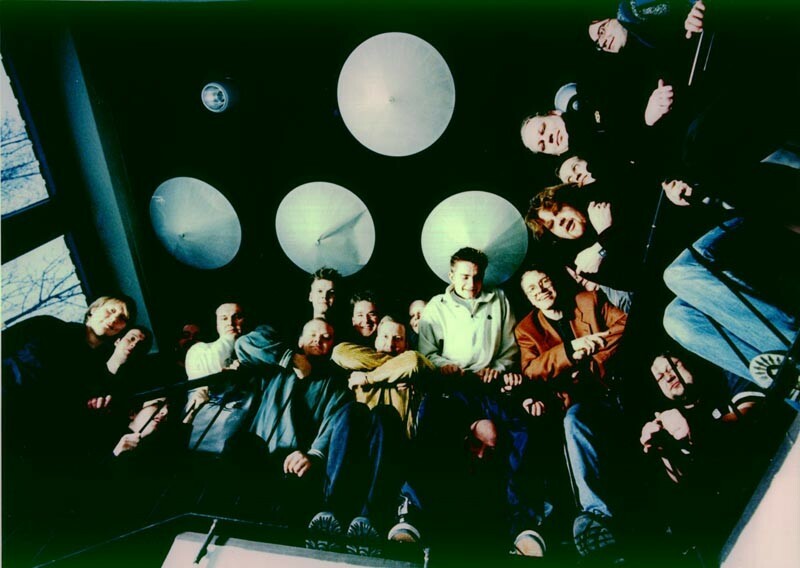 The orchestra posing for the CD leaflet during a recording session at the Finnvox Studios, Helsinki, Finland. 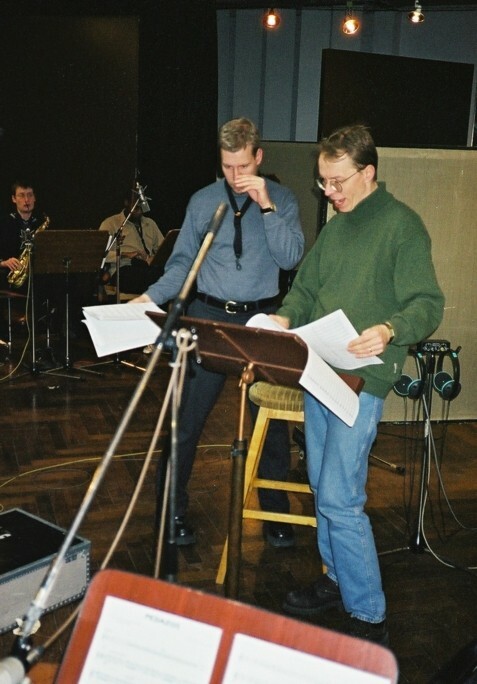 Me digging into my scores and Pekka Pylkkänen (to my left) digging his nose during a recording session with JLACJO. 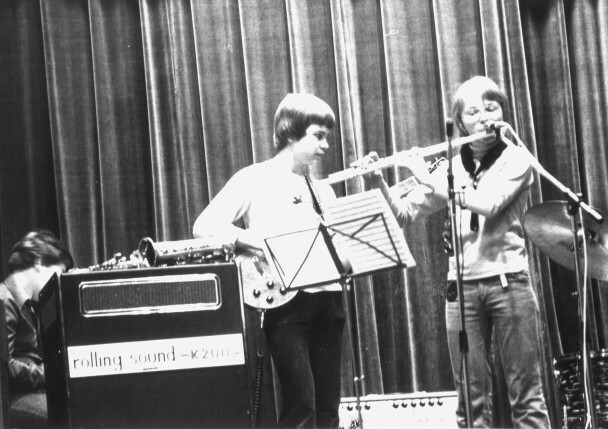 Behind us you can see Ari Jokelainen and Yoel Terry on saxes. 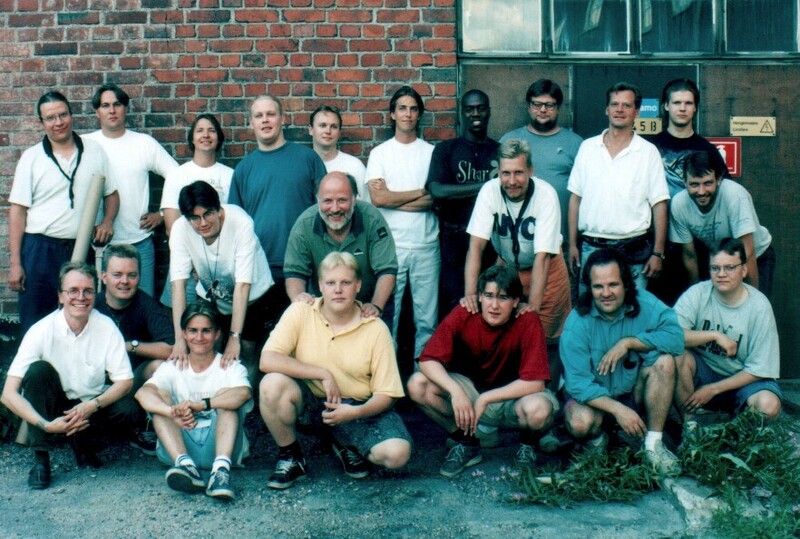 I'm in the front row, first from left. 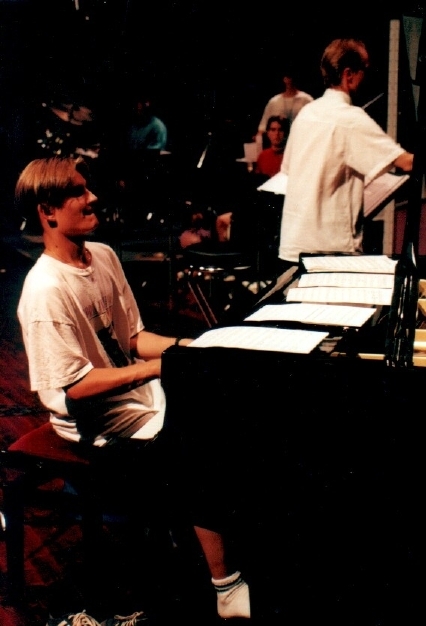 With Lenni-Kalle Taipale on the piano, during a JLACJO recording session in August, 1997. 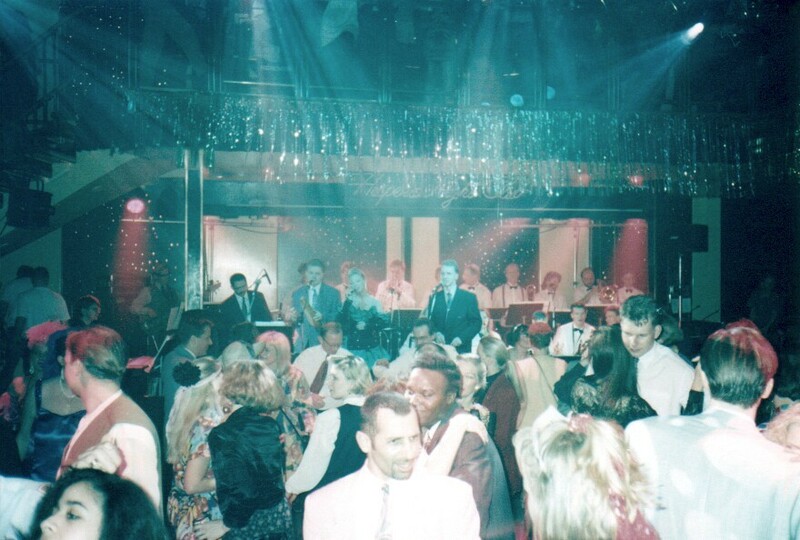 This is Mario Grillo of the Machito Orchestra (USA), with me conducting and singing with the Settlemen Big Band at the Hesperia Winter Carnival, 1995. Front row of the band from left: Grillo, Sami Pöyhönen, Pauliina May and me. I played a couple of years in the bands of the great Senegalese guitarist, Badu N'diaye. 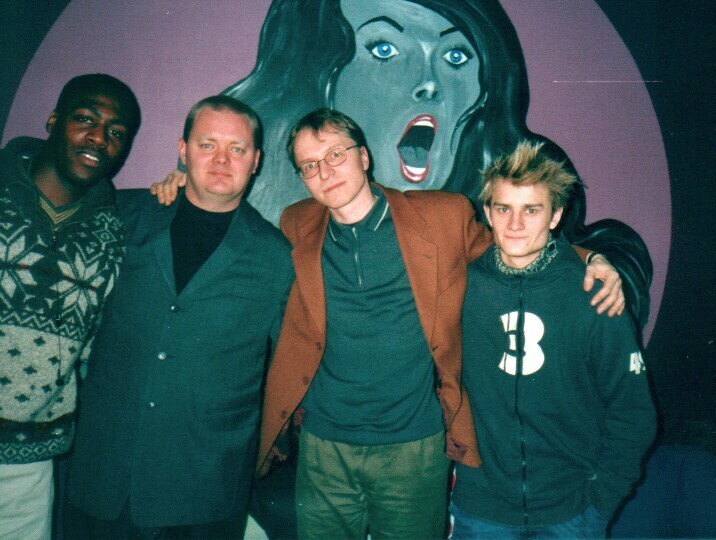 From left: me on the bass, Tommi Lindell, Badu, Tuomas Peippo and Ismaila Sane. 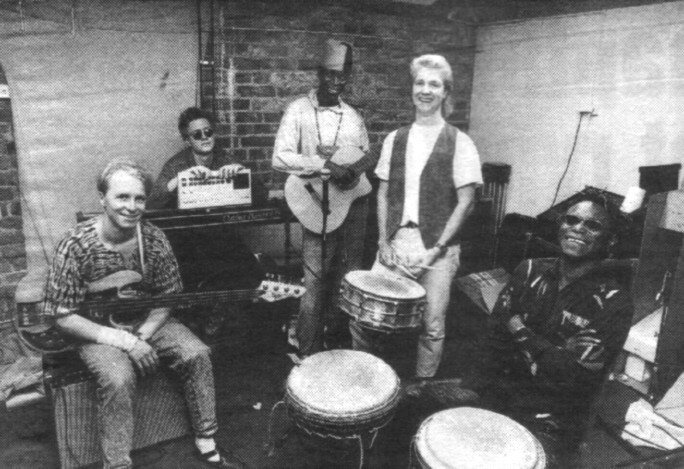 I had a funk band for a few years, with a name like a mathematic equation: X=X. 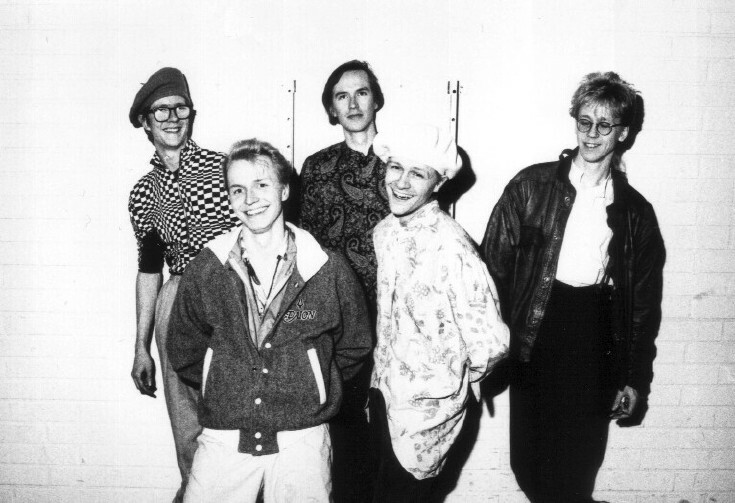 From left: Tommi Lindell (keys), me (bass & lead vocal), V-P Suomalainen (keys), Arto Tuuli (drums) and my cousin, nowadays the one-and-only Sound Damager (for The Rasmus, ao. 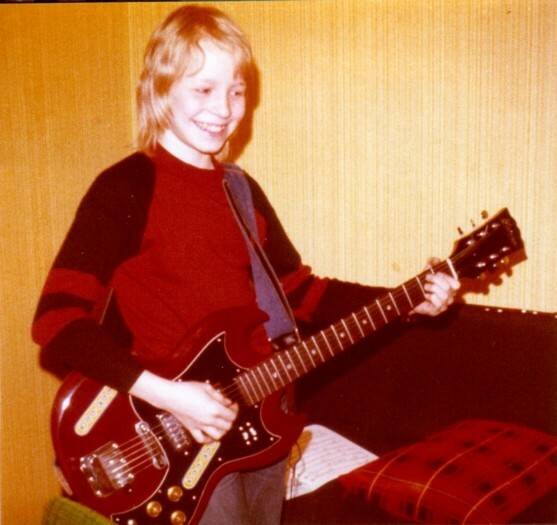 ), Smoju Paju (guitar). 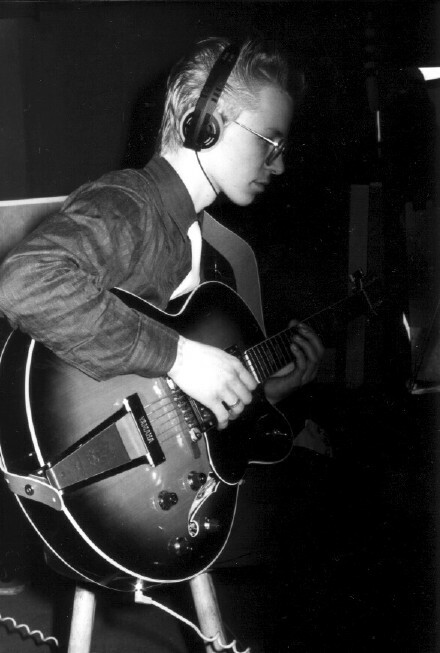 This is taken from a recording session - I guess the year is 1981. On tour with the American Rock 'n' Roll figure, Ray Campi. 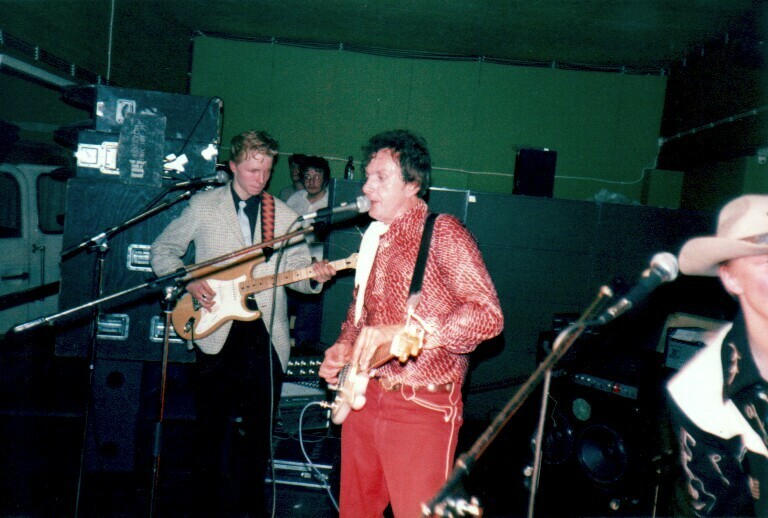 From left: me on guitar, Ray, Ari Hanninen. Soloing with the OYK Brass Band. 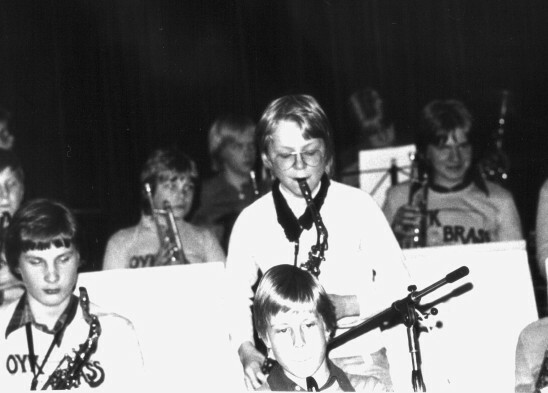 Note the even-younger Pekka Pylkkänen in front of me, in clarinet!